On 14 December 2012, the annual BCLA ALPS December meeting was held at the Langara College campus. The panel speakers represented their academic institutions – Simon Fraser University and University of British Columbia, Vancouver (both located in the Greater Vancouver area) and the University of British Columbia, Okanagan (situated in the Kelowna southern interior area) in British Columbia. 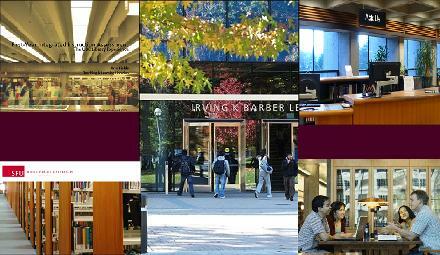 One theme focused on two main areas academic libraries are currently facing – library service reviews and assessment. The library service reviews’ discussion drew attention to the trends, challenges, opportunities and implementation solutions that are changing the academic library landscape. The other theme highlighted was UBC Library’s Strategic Plan 2010-2012 and how one of its core goals is to enhance student learning by “deliver(ing) a responsive, integrated program of services and create(ing) exceptional learning and research environments” as it relates to assessment practice and implementation in academic libraries. Without further ado, we are pleased to announce that the videorecording and slide presentations are now available in cIRcle, UBC’s Digital Repository! URI: http://hdl.handle.net/2429/43866 – Click on “View/Open” to view and/or download the videorecording and accompanying slide presentations. Assessing and incorporating teaching and learning resources by and about First Nations, Metis and Inuit peoples is critical for librarians, educators and parents. Awareness of diverse epistemologies, notions of cultural authenticity and historical accuracy, and the influence of colonialism, are essential when considering books, films and interactive media for library and classroom collections. This panel will address challenges facing Indigenous and non-Indigenous librarians, educators and parents when drawing upon materials representing Indigenous peoples and cultures. They will offer insights about such issues as cultural appropriation, stereotypes, addressing colonialism and what to do with dated resources. This session is ideal for teacher candidates, classroom teachers, teacher-librarians, youth librarians and parents. Allison Taylor-McBryde, Adjunct Professor, School of Library, Archival and Information Studies. Debra Martel is the Associate Director of the UBC First Nations House of Learning. Debra has dedicated over 22 years working in the public K-12 school system in a variety of teaching and administrative positions before joining UBC in August, 2011. She is passionate in her work and strives to create learning environments that are both inclusive and rewarding. She is proud of her Cree, Metis, Irish and Scottish ancestry. Allison Taylor-McBryde is an Adjunct Professor at the School of Library, Archival and Information Studies at the University of British Columbia. She is also Coordinator for Children’s & Young Adult Services at the North Vancouver District Public Library. Rather than making libraries irrelevant, the overabundance of information today makes it more important than ever for students to access the skills and knowledge of librarians to learn to manage information – both to save time and to acquire the best information available. Together with library collections and services, library space is a key core mission. Libraries today are hubs for a variety of uses, from teamwork and collaboration to building a sense of shared mission among users. The Canaccord Learning Commons, currently under construction at Sauder School, is a good example of how we are expanding the notion of the library beyond its traditional borders – incorporating new technologies and innovative physical spaces. Thanks to Lindsay Ure for pointing out Gregg’s blog.